Boeing Co.'s long-anticipated 787 jet touched down on British soil Sunday, tipping its wings to the crowd and building buzz at the Farnborough International Airshow, the industry's premier event. The arrival of the blue-and-white 787 after years of delay underlined hopes that the two-year downturn in the aviation and defense industry is nearing a bottom. Boeing Chief Executive Jim McNerney claimed that the 787 would be "the way planes are going to be built for the next 80 years." But he acknowledged that delivery of the aircraft - already more than two years overdue because of production problems - could slip into 2011. He blamed administrative delays. "End of the year is the plan," McNerney said. "There could be some paperwork that pushes it into next year." Concerns remain about the slow global economic recovery and sharp cuts to national defense budgets. New orders for commercial aircraft are likely to be restrained and restricted to buyers from strong emerging markets in the Middle East and Asia, while activity on the defense side of the show is expected to be muted. Boeing and its archrival Airbus, meanwhile, head into the event facing growing challenges to their duopoly in the mid-sized civilian jet market from smaller manufacturers, including Canada's Bombardier and Brazil's Embraer. Analysts, who are looking to Farnborough to take the pulse of the industry's health, expect the event to be more upbeat than last year's sister show in Le Bourget outside Paris, but they aren't holding their breath for commercial plane orders anywhere near the record-breaking $88.7 billion worth announced in Farnborough in 2008. "A lot depends on if the economic recovery continues, if there is a double dip in the recession, then all bets are off," Forecast International analyst Raymond Jaworowski. "We should start to see orders accelerate late this year." The Geneva-based International Air Transport Association has forecast that global industry profits will reach $2.5 billion this year, an upturn from the huge $9.4 billion loss in 2009. Analysts expect Asia and North America to lead the recovery, with Europe lagging behind. Strikes at some airlines, the debt crisis and the volcanic ash cloud that caused major disruptions this spring are all hurting Europe's recovery. More than 1,000 exhibitors from 38 countries have signed up for Farnborough with delegations from Egpyt, Taiwan and Morocco will be attending for the first time. Organizers also cited stronger interest from major players China and Russia. Among likely buyers at Farnborough are Emirates airline, the largest in the Gulf states and Qatar Airways, which is looking to equip a new low-cost carrier in the region. Emirates is preparing to announce a "substantial deal" at Farnborough as early as Monday, according to person familiar with the order who was not authorized to discuss the plan publicly. The person would neither confirm nor deny reports that the company, already the world's biggest Boeing 777 operator, was ordering as many as 30 more of the aircraft. TUI Travel PLC, the parent company of Thomson Airways, said it would be the first British airline to take delivery of the 787 in January 2012, buying 13 aircraft across the group. ATR, an Italian-French aircraft manufacturer based in Toulouse and owned by EADS parent Airbus and Finmeccanica, may announce some turboprop orders. Boeing last week downplayed the likelihood of big deals at Farnborough, stressing it didn't save up orders for international shows - a dig at Airbus' tendency in recent years to announce a block of attention-grabbing announcements at Farnborough and Le Bourget. "At the end of the day, what matters is where we are at the end of the year, or over the longer term," said Randy Tinseth, Commercial Airplanes vice president for marketing. Airbus chief salesman John Leahy was more upbeat about the show, which runs July 19-25 at an airfield about 30 miles (50 kilometers) west of central London. He said Saturday that he had bet EADS head Louis Gallois "that we'll more than double" the 131 gross orders that Airbus has made to the end of June. Potentially of more interest to industry watchers are the emerging signs that the old duopoly of Chicago-based Boeing and EADS-owned Airbus in the commercial plane making market is on the wane, particularly in the lucrative single-aisle, narrow-body sector. Boeing and Airbus currently account for more than two thirds of output and 40 percent of sales in the sector, but smaller rivals are stepping up - Canada's Bombardier Inc. picked up a strong 80-plane order earlier this year from Republic Airways Holding Inc. for its C-Series. "We have new competitors now," Gallois acknowledged, while adding that Bombardier and China's state-owned Comac are still years from making a dent in the markets for the Airbus A320 and Boeing 737. Bombardier's C-Series is on track for its first delivery in 2013. Comac is readying for a 2016 first delivery date of its C919. Russia's Irkut and Brazil's Embraer are also rising contenders. 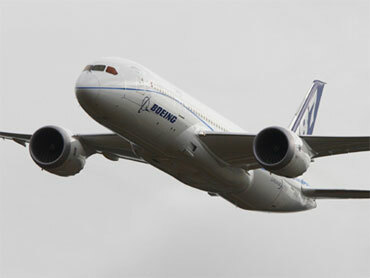 Boeing is hoping to retain some of the limelight with the international debut of its fuel-efficient 787. The announcement that its first planned delivery of the aircraft - to Japan's ANA - might be delayed by inspections and instrument changes was a setback, but the sight of one of five of the test planes landing at Farnborough on Sunday - the first time one has left U.S. airspace - was a major draw. Boeing officials took journalists and U.S. congressmen on a tour of the 787's cabin, where they chatted with pilots and engineers and played with the dimmer switch on the plane's windows. Also on show at Farnborough will be another aircraft with a troubled and lengthy production history - Airbus' long-delayed A400M military transport plane. Britain has already scaled down its order for the four-propeller military transport plane, which will take part in the daily flying display at Farnborough. Airbus expects to start delivering A400Ms sometime after December 2012 - around four years behind schedule and 50 percent over budget because of technical glitches. The original seven customer nations for the aircraft - Belgium, Britain, France, Germany, Luxembourg, Spain and Turkey - agreed with Airbus' parent European Aeronautic Defense & Space Co. in March to spend an additional euro3.5 billion to save the project after months of bickering about who should pay for cost overruns. The project is a high profile symbol of the problems facing the defense industry amid budget cutbacks. Gallois said Saturday that he is "enormously frustrated" with the World Trade Organization, which he claims is being "unfair" by delaying its report on complaints against Boeing. "We are in an abnormal and increasingly unfair situation," Gallois said.